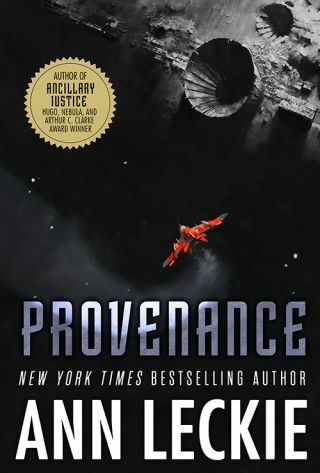 In "Provenance" (Orbit Books, 2017), released today (Sept. 26), a woman who's trying to recover priceless artifacts ends up at the center of a multiculture, multispecies conflict on a planet covered in ancient ruins. The new novel's author, Ann Leckie, explores another corner of the universe explored in her trilogy that began with the Hugo-winning"Ancillary Justice" (Orbit Books, 2013). Space.com: Why did you decide to write this new story in the universe you explored for the "Ancillary" trilogy? Ann Leckie: I had decided that whatever my next project was going to be, I wanted it to be something fun — something that I would find fun and that readers would find fun. And I said, well, what's a space opera thing I really love? One of my favorite tropes is ancient alien archaeology, [so] I started reading about the history of archaeology, and that ended up bringing me into the history of art collecting and museums. In the end, the ancient alien artifacts never really made it into the story, but I ended up writing a story about collecting artifacts, collecting things that were significant, and museums, although there aren't technically museums in this world. But that was essentially how I came to it; I started with one idea and ended up veering off to the side of it. Ann Leckie, author of "Provenance." Space.com: What were some of the themes you were excited to explore in the story? Leckie: When I was reading about the history of museums and, to a certain extent, the history of archaeology, I was really struck by the way that civic museums — places like The British Museum [in London], the Met[ropolitan Museum of Art] in New York — are, in some ways, a claim to a particular heritage … The standard path is Egypt, Greece, Rome, medieval Europe and then us, the modern era. In some ways, it's a claim to have inherited a particular civilization or a claim to be the holders of that civilization. That got me started thinking about also how that applies to families, and that became a major theme of the book: how people deal with their families, the kinds of things you inherit from your family. Do you want them; do you not want them? Are they good; are they bad? Often, they're both, or they have elements of either. Some people have it worse than others; some people have it better than others. That question of parents and children and family relationships became really central. Space.com: Did you incorporate any research into real-world science or culture into your world-building? Leckie: I did, but there wasn't necessarily one [culture] in particular. I did do a fair amount of reading about art collection, about art fraud, about the history of museums in general. With the Radch [the civilization in the "Ancillary" trilogy], there was a very definite model; it wasn't my only model, but the main model was the Roman Empire. In this case, there isn't actually a particular culture, so I was just grabbing things that I thought looked cool and sticking them together. Space.com: You showed interactions between really different human cultures, and with human and alien cultures, such as the Geck, as well. Leckie: The contrast is so fun. Writing the Geck ambassador was a lot of fun. Reading and writing, I really enjoy seeing the way that a human culture that might be more or less understandable to us looks different when set next to a very, very different culture that almost might be unrecognizable. Space.com: What was the hardest part of switching away from the characters and cultures you'd already established in previous books? Space.com: Can you talk about the technology, like the remote-controlled "mech" robots, that you deployed throughout the book? Leckie: The mechs were fun. What I wanted was something that would have a much more biological component than we usually think of machines as having. I did do some reading about how, for instance, spiders moved and worked. And they end up not being really like spiders, but I kind of cheat and call them spider mechs. But I did kind of want to go in a more biological direction with that, and I also wanted something that could act as kind of a mask, because a main thing that happens in the book is that nobody's sure who's operating what spider mech. That's kind of their main use. But I have to admit, when I started writing, very often, what I'll do [is] just throw a bunch of things in the first couple chapters, and then as I'm going along, I'll pull things out of that box and use them. When I wrote the spider mechs, I was just like, "This is kind of cool," and I didn't know that was how I was going to use them … I was just intrigued by using something that seems like it might be an AI but wasn't an AI, something that needed involvement from another person. Space.com: Your "Ancillary" books are known for portraying a genderless society, and "Provenance" has three genders. What prompts you to continue exploring that theme? Leckie: I'm not 100 percent sure. In some respects, I think my interest developed because of having written "Ancillary Justice," which I began writing thinking, "Wouldn't it be fun to write a society that doesn't care about gender?" As I dug more into that, that became more and more complicated a problem, and I saw that it was way more complex than I had thought it was when I started. To some extent, the process of learning things as I wrote the trilogy has made that a more interesting topic for me even than it was when I began. In this one — when I finished the trilogy, a lot of people really enjoyed the use of default feminine in the trilogy. It was something I really enjoyed, but some folks had pointed out, and I think they're right … that as cool and fun as that is, that does kind of not acknowledge the way that gender is actually fairly complex. In a lot of respects, this book isn't about gender at all, but I wanted to acknowledge that yeah, gender is more complicated, and it's not. We say there are two categories; that's our culture. Other cultures have different answers and different structures for how they deal with this, and so I just wanted to say — and, in the future, in space, with people all over the place — you're going to get a lot of different ways of looking at this. Space.com: If you move on from this universe, what will you explore next? Leckie: My short fiction was set in a very different kind of universe, and people who read me as a short-fiction writer were kind of surprised to discover that I had a totally different science-fiction universe. And so it would be fun to get back into that world, which is one that I really enjoyed. But also, I certainly don't want to bore myself. The trilogy — each of the three were very different books even though they were part of the same trilogy, because I would have bored myself otherwise. I just like to do different things. Space.com: Do you think you have some stories about those ancient alien artifacts still to come? Leckie: Oh, I would imagine so. Ancient alien artifacts are kind of awesome and cool, right? This article has been edited for length. You can buy "Provenance" on Amazon.com.